Yes it was great today I had plenty of "Leucorrhoa" Wheatear especially on Farleton (read below) 3 on Dalton and 8 on Farleton. Yesterday (Friday) I did check out Dalton Crags but no Wheatear showing. Just one Tree Pipit at the top of Hypericum Way which was constantly singing and displaying. Today (Saturday) Still no Garden Warblers and still the single Tree Pipit doing some fabulous displays whilst giving off his song. Had three "Leucorrhoa" Wheatear with two on the walls and one on the ground on Wheatear Plain. All very upright and all showing the dirty blue backs (presumed male). Stonechat male and female seen around the "line of trees" areas. A Tawny Owl crossed my path and coming from South to Storth Wood - Dalton where I heard it calling from five minutes after passing. I had Chiffchaffs calling from Farleton Rise, Rowley Copse, and 50 yards below Rowley Copse where I also had a Blackcap calling. On the Fell itself I had ten Wheatear of which 8 were presumed of the "Leucorrhoa race" and all were dirty blue coloured, these were spaced out along the full length of the fell and mainly in pairs. 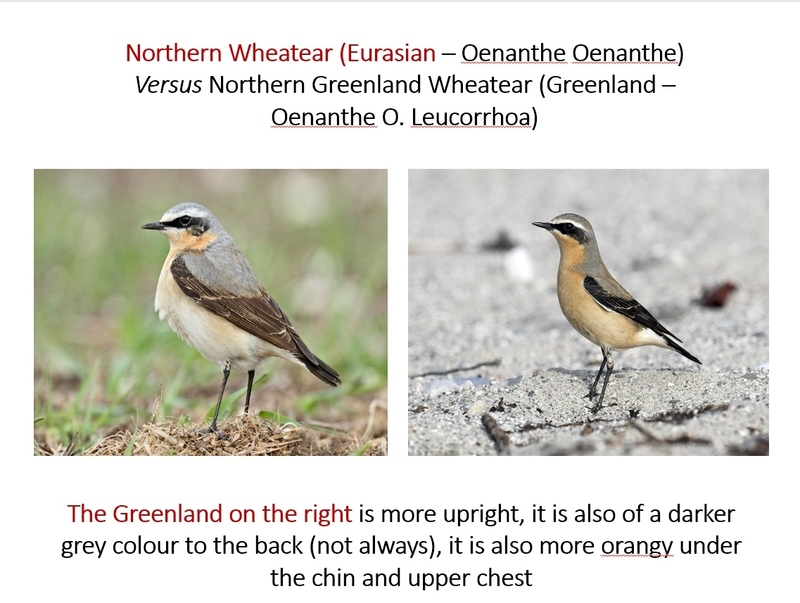 I had a further two presumed to be O.Oenanthe - Eurasian which were a male and a brown female and thought to be breeding local. Also several Swallows from the Whinn Yeates Farm, a single female Yellowhammer on territory. Views of a splendid "Lesser Whitethroat" was seen just above the Gorse areas. The area were I have recorded them now for the past couple of years. At the Old Lime Kiln (filled in) behind Whinn Yeates I noticed the ferns where doing really well and the Asplenium.Ceterach (Rusty Back Fern) was showing 6 little groups coming through. Also Maidenhair Spleenwort, and what is thought to be the rarer "Black Spleenwort" and Common Rue. Very surprised to see a Brimstone Butterfly high on the fells heading with haste to the South. Also heard Linnets, lots of Skylarks and Meadow Pipits. flowers included Rue Leaved Saxifrage, Parsley Piert (all gps recorded). I am told a Swift was recorded going over Arnside yesterday.